The Transcribe! 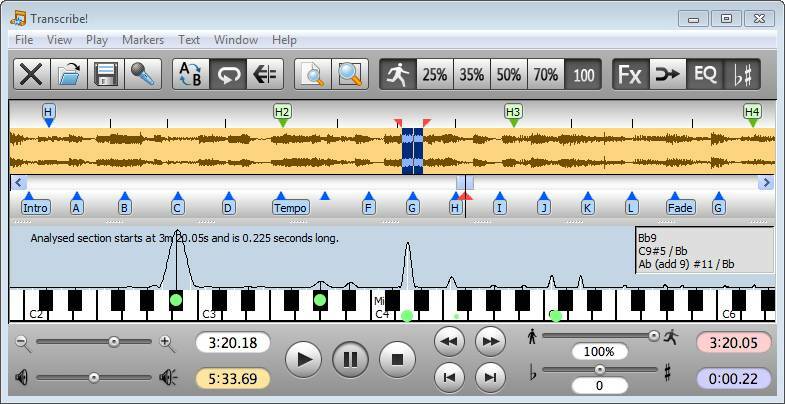 software from “Seventh String Software” helps you to work out a piece of music from a music recording. It does not do the complete transcribtion for you, but it can change pitch and speed instantly, and you can store and recall any number of named loops (a perfect features for practising music). How can Transcribe! help you, to write down your music? The software Transcribe! costs about US$ 39,- for a single copy license – depending on your location, local taxes will be added where applicable. There are also discounts available if you want to order more licenses of Transcribe for your school or any other organisation.